This study examines how selective chemogenetic stimulation of noradrenergic neurons of the Locus Coeruleus (LC) in mice modulates cerebral metabolism and vascular tone. This was achieved by using a transgenic mouse line selectively expresses Designer Receptors Exclusively Activated by Designer Drugs (DREADDs) in the LC noradrenergic neurons. A multimodal imaging approach was used, with MRI being used to evaluate hemodynamic changes and PET being used to assess glucose metabolism. Previously, we have developed a single-vessel fMRI method to visualize the hemodynamic signal propagation from individual venules and arterioles in the deep layer cortex. Here, we combined single-vessel fMRI with optogenetic photo-activation to map vessel-specific fMRI signal from the rat hippocampus. A MGE sequence was used to distinguish the individual arterioles and venules penetrating the main structure of the hippocampus. 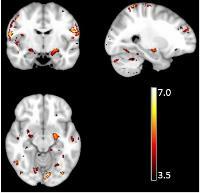 The BOLD-fMRI signal was mapped to overlap with the individual venules. This result makes it possible to study the coupled neuronal and vascular interaction in the focal hippocampal stroke rat model, which may mimic the pathophysiological basis of transient global amnesia in human. In the auditory system, the midbrain inferior colliculus (IC) receives massive corticofugal projections, yet their functional implications remain unclear. Previous studies utilizing single neuron recordings and electrical activation or cryogenical inactivation of the cortex could not provide a cell-type specific understanding of the large-scale corticofugal modulation effects. This study combines auditory and optogenetic fMRI to investigate the corticofugal influences on auditory midbrain processing. 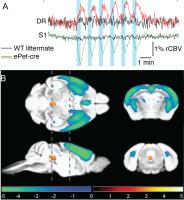 Large-view fMRI was used to monitor the IC noise response during cell-type specific optogenetic stimulation of the VC. The results demonstrate the feasibility of this novel approach and show that VC normally facilitates auditory midbrain responses. Identifying key differences between the paralemniscal and lemniscal pathway in the somatosensory system remains a challenge for electrophysiological studies due to limitations in spatial coverage. The use of optogenetic fMRI (ofMRI) however, provides an opportunity to map the large scale differences between the two pathways. Our key findings include, (1) differences in multisensory and motor system interaction when stimulating paralemniscal compared to lemniscal pathway and (2) differences in activity patterns when stimulating paralemniscal pathway within the whisking frequency range. In all, ofMRI provides an added dimension to existing electrophysiological studies to advance our understanding of information processing in thalamocortical circuits. With the aim to develop a novel MRI-based approach for detection of activation in neuronal networks associated with feeding behavior in a rat model, we evaluated the potential of pharmacological MRI (phMRI) to detect DREADD (Designer Receptor Exclusively Activated by Designer Drug)-evoked neuronal activity. BOLD phMRI was conducted under 1.5% isoflurane anesthesia at 9.4T. Pharmacological activation induced a significant BOLD response in DREADD-targeted areas, which was confirmed by cFos-based immunohistochemistry of neuronal activation. Our study shows that phMRI allows detection of specific DREADD-evoked neuronal activity, providing exciting opportunities to assess network activity in association with feeding-related behavioral phenotypes. In this study, we unraveled the circuit and network connectivity of the rodent external globus pallidus (GPe), both in the healthy animals and a parkinson's disease model. We also employed multiple stimulation types (electrical and optogenetic), as well as fMRI modalities (evoked-fMRI and functional connectivity analyses) to provide an exhaustive analysis of this dynamic brain nucleus. In this abstract, the input/output transfer relationship in human hippocampal subfields (mainly CA1, CA3, and DG) was studied using fMRI during a spatial memory task with increments in the change of FOV in the stimuli. 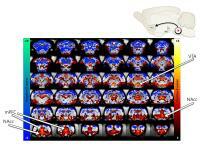 Whole brain activation was obtained for all lure v/s control contrasts. Mean activation t value for each hippocampal subregions (CA1, CA2&3 and CA4&DG) was extracted, averaged over all the subjects and plotted against FOV changes to compare with the existing models. K-means clustering was then applied. Data from one of the k-means clusters showed a pattern separation/completion curve similar to the animal model. 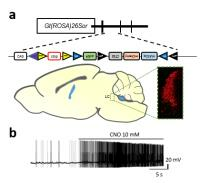 Mouse functional MRI was used to investigate the effect of selective stimulation of serotonergic neurons of the dorsal raphe via channelorodopsin-mediated optical control. Electrophysiological recordings in the nucleus and in projection areas confirmed neuronal activity changes upon illumination with blue light. Acute pharmacological modulation with fluoxetine, a serotonin reuptake inhibitor, lead to increased CBV response upon 5HT release, while animal restraint prior to measurements lead to a reduction of the elicited response. This study demonstrates the feasibility to assess a neurotransmitter function non-invasively at a whole brain level and investigate alterations in mood-controlling systems. In this study, we aim to provide in vivo evidence of using this novel electrode array for selective deep brain stimulation (DBS) in rats with simultaneous fMRI readouts. This novel development opens up a new avenue to explore and validate functional connectivity in the brain with a resolution and specificity that cannot be achieved by traditional fMRI or fcMRI approach. With the line scanning technique BOLD responses can be recorded with 50 ms temporal resolution. Here line scanning fMRI was combined with optogenetic stimulation of excitatory neurons in rat somatosensory cortex. The light for optogenetic stimulation was delivered by an optical fiber implanted in the brain. It was possible to compare BOLD responses upon optogenetic and sensory stimulation with high temporal resolution and shorter times to reach half maximum were found for optogenetic stimulation. 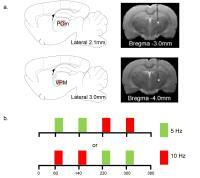 Furthermore the spatial resolution offered the possibility to observe cortical layer-specific BOLD signals.